The Fantastic F/SB is an easy-to-use high volume unit with ultra-efficient operation designed to save you money. The Citrocasa Fantastic F/SB is the perfect match for grocery stores and self-service restaurants that offer self-service and fresh squeezed juice by-the-glass. Because this is a high volume unit, we recommend either a bottom cart or counter top kit. Thanks to its revolutionary design, the new Fantastic series can be disassembled extremely quickly and easily. With its combination of the innovative Cross-Holder, the Double-Cover system and the special peel ejectors, the machine can be taken apart for cleaning and re-assembled in a fraction extremely quickly. 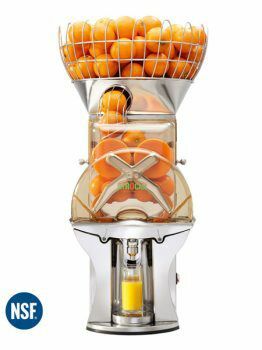 The Citrocasa Fantastic F/SB makes it possible to remove all components that contact the juice from the machine for easy cleaning in the dishwasher – it couldn’t be simpler! Click here to download more information about the CitroCasa Fantastic.